Crane flies are a type of insect that resemble exceptionally large mosquitoes. These flies have very slender bodies and legs that look very similar to stilts. The legs are considered to be deciduous, meaning that they are easily capable of falling off of the insect due to the manner in which they attach. The wings of the crane fly have a span of up to 6.5 cm. Crane flies have antennae that has up to 39 different segments. Crane flies are most often recognized by the v-shaped distinguished suture, which is located on the back of the thorax region, in proximity to the wing venation. In this comprehensive guide, you will learn a number of important facts pertaining to crane flies. In various regions of the world, crane flies are considered to be highly beneficial when it comes to decomposition processes within forests and streams; however, there are types of crane flies that have the distinguished ability to damage lawns. The larvae of these types of flies, which are often referred to as “leather jackets”, are known to feed on the roots of various types of plants – especially turf grass. When populations of the larvae reach high levels, the lawns where the insects are present become damaged. It is during the summer months when adults mate and then deposit their eggs. 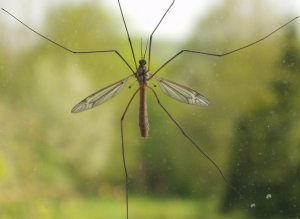 While adult crane flies are harmless to humans and plants, they have the potential to become a nuisance if they find their way inside of your home or other types of structures on your property. In order to determine if the leather jackets of crane flies are feeding on the plants in your lawn, you must observe the area. If you see any type of brown spots in the region, it is likely that you have an infestation. If your lawn is considered to be healthy, it will bounce back from an infestation of leather jackets; however, if you find that your lawn is not recovering, you will need to take immediate action. While there are pest control treatments available for crane flies, it is best to opt for professional pest control treatment. These professionals should be contacted in mid-April; however, this time of year offers more of a preventative pest control. If you find that your lawn is damaged, you may contact pest control professionals any time of the year.